Conservationists have taken the first step in their quest to save the world's rarest duck - the Madagascar pochard. After being hampered by harsh weather and illness, a team successfully set up a small rearing facility for the ducks. This rescue plan was mounted when scientists realised how close the birds were to the brink of extinction. 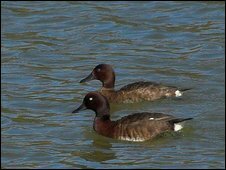 The pochards were believed to be extinct in the late 1990s. They were rediscovered in 2006 but are now classified as critically endangered. The project involved the Durrell Wildlife Conservation Trust and the Wildfowl and Wetlands Trust (WWT). The birds were found on only one volcanic lake in Madagascar. A reconnaissance visit to the lake earlier this year spotted only six females and revealed evidence that chicks of just a few weeks old had died. So the decision was made to protect the few remaining birds by setting up a captive breeding programme. Scientists monitored the birds during the breeding season and noted when the female birds were preparing to lay eggs. "Duck specialists" then flew to Madagascar to bring the precious eggs into captivity. Dr Glyn Young from Durrell said it was a "race against time" to get to the lake before the eggs started hatching. "Massive electrical storms had delayed our arrival in the country. Once all the equipment had cleared Customs, we had to wait for three days as a bridge was repaired on the only access road to the lake," he recalled. "To add to our woes, having finally made it to the lake, we all fell ill!" But, after all the set-backs, the team commandeered part of a local hotel to create a temporary breeding facility. They then travelled to the lake and removed a batch of ready-to-hatch eggs from a lake-side nest. "The eggs were hatched by the side of the lake," said Andrew Terry from Durrell. "We set up a lab in a tent with all the equipment and the chicks fully hatched out in an incubator." The day-old chicks were then taken to the holding facility in a four-wheel-drive. 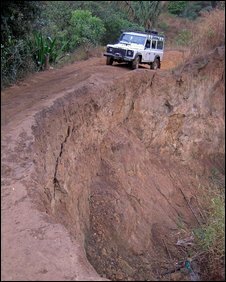 "It was a delicate eight-hour journey on really dodgy roads," Mr Terry said. Peter Cranswick from WWT said: "Safely bringing birds into captivity marks the start of a 20- or 30-year conservation project that will also help restore wetlands across the region." Eight rescued ducklings are now reported to be doing very well. They represent a very large proportion of the population; as of 2008, only 25 adult birds were counted in the wild. Work is continuing and the team will attempt to secure two more clutches in the coming few weeks.